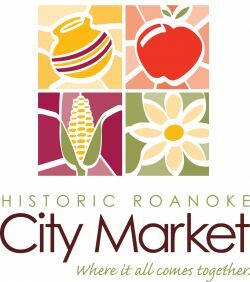 The Historic Roanoke City Market (popularly known as the Farmer's Market) is the oldest continuously operating open-air market in the Commonwealth of Virginia. It began in 1882, when licenses were issued to 25 area "Hucksters" (vendors). The market area has since gained popularity for its amazing selection of locally grown plants, fresh fruits, and vegetables. Be sure to stop by and visit the market area’s oldest continuous vendor, Martin’s Plant Farm. The Martin’s have had a presence at the market since 1904! The first City of Roanoke Charter formally authorized a municipally-owned market in 1884. The first City Market Building was completed in 1886 and formed the core around which the Curb Market and Market Square developed. The original building was destroyed by fire and was replaced by the current building in 1922. After serving as an indoor market for many years, the City Market Building was renovated into a food court in the mid 1980s, and gained much popularity as a must-visit food venue throughout the years. The Historic Roanoke City Market is open year-round, seven days a week, and closes only on Christmas and New Year's Day. There are 42 permanent tables covered by awnings that mark an inviting display of fresh fruits, vegetables, flowers, and plants during growing season. There are additional spaces in Market Square where vendors erect tents to display their wares. In recent years, a number of artisans have joined the farmers and planters offering handcrafted items, unique jewelry, and other art objects. The market even boasts a variety of fresh meats and baked goods! The Historic Roanoke City Market has been recognized as a "Great American Public Place" by the Lyndhurst Foundation along with other winners like the Vietnam Memorial in Washington, DC and Central Park in New York City. The City Market is also a member of Panetizen's "Top 100 Public Spaces in the US and Canada." Locally, the market receives many "Best of Roanoke" awards by readers of the Roanoker Magazine, the Roanoke Times, City Magazine, and Virginia Living Magazine.